Public ride days are the highlight for the club. They are conducted on the third Saturday and following Sunday of each month from 10:00 am until 3:30 pm. In 2006 we gave rides to over 30,000 people. The club has a variety of engines and riding cars. 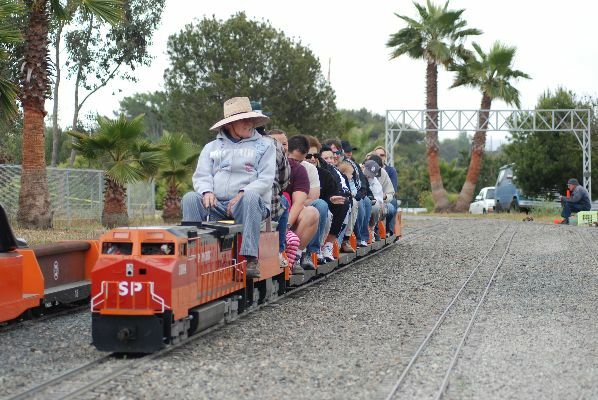 Trains on public ride days are made up of 4 to 6 bench cars that seat 5 to 6 adults and children per car. 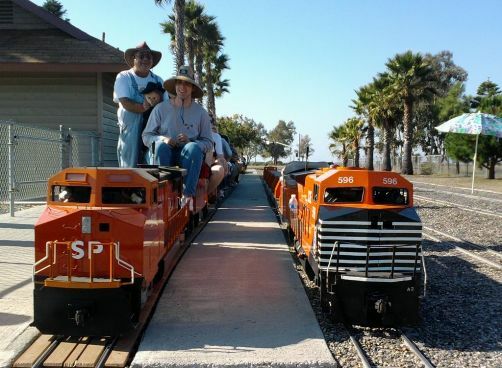 Rides are free; however, donations are welcome and help keep the trains running. Our primary interest is running a safe and reliable first class railroad. Members take great pride in the design and engineering of the facility. For Children to ride the trains, they must be able to walk and be at least 31" tall. Many dedicated volunteers donate countless hours keeping this railroad safe for all who share the joy in "riding the rails". A typical trip takes about 12 minutes and covers two loops of the park. Bridges and terrain variations are just part of the scenery as is the back end of the Costa Mesa Golf Course.